English National Ballet opens its acclaimed Nutcracker at Milton Keynes Theatre this evening and First Artist Barry Drummond is looking forward to a busy run. The festive family favourite boasts a sparkling seasonal story, captivating characters and delightful dancing. This ballet’s enduring popularity has seen the Company present a Nutcracker production every year since 1950, its founding year. Last Christmas, over 73,000 people made watching a performance of English National Ballet’s Nutcracker at the London Coliseum part of their holiday celebrations. This year’s tour (beginning in Milton Keynes and then visiting Liverpool before a return to the Coliseum) continues the annual Nutcracker tradition while bringing choreographer Wayne Eagling’s version to audiences outside the capital. First Artist Barry Drummond is already embracing the Yuletide season thanks to Nutcracker. As well as looking forward to being part of audience members’ Christmas celebrations, he is eager to make the most of his own festivities when the big day finally arrives! 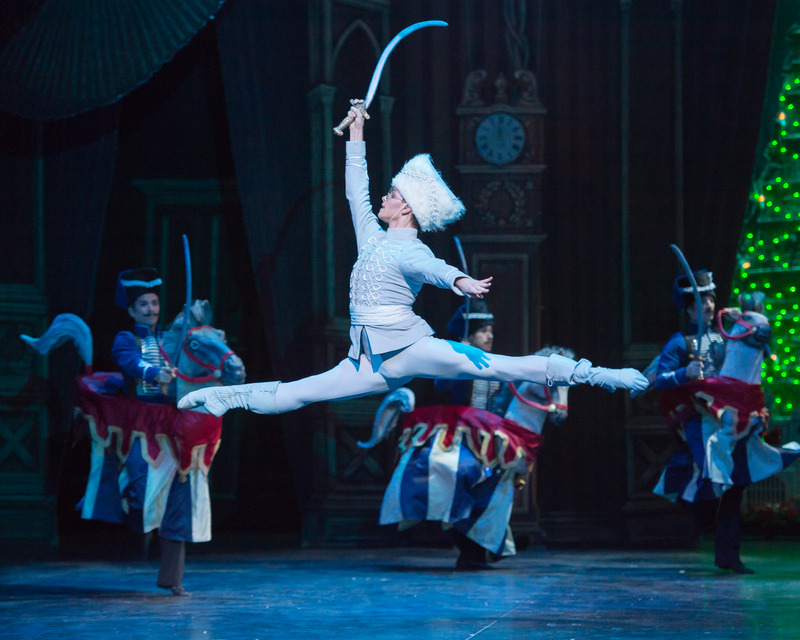 Who will you dance as in Nutcracker during its run at Milton Keynes Theatre? I will be dancing Older Freddy, Lead Flower Couples, and in the Spanish and Chinese dances. What do you most look forward to when dancing in this particular ballet? It’s Tchaikovsky’s score that makes this ballet so special. It embodies all those festive emotions that I associate with Christmas, so hearing English National Ballet Philharmonic fire up and play is what I always look forward to most. English National Ballet’s Nutcracker has almost sold out at Milton Keynes Theatre – what do you think makes this ballet so popular? Nutcracker is a one-way ticket to festive cheer, and people love Christmas. So, what better way to begin your festivities than a trip to the theatre that will leave you feeling joyful and ready to celebrate? Are you feeling Christmassy yet? What makes for a perfect Christmas for you? Winter is my favourite season, and I absolutely love Christmas, but I try to wait until December before I begin my festivities. But with Nutcracker performances already upon us, I really have no choice but to feel Christmassy! My perfect Christmas is mulled wine and a Christmas movie on Christmas Eve then a full day of eating with the people I love on Christmas Day. Do you have any New Year’s Resolutions yet? What do you hope 2017 will bring? I tend not to make resolutions but I have been nagging myself to get to the theatre more often, so I guess that’s the closest I’ll get to making one. And I can only hope 2017 brings me as much love and happiness as I’ve enjoyed in 2016! > English National Ballet’s Nutcracker comes to Milton Keynes Theatre from Wednesday 23rd November until Saturday 26th November 2016. The Company is also holding a series of workshops at the venue.